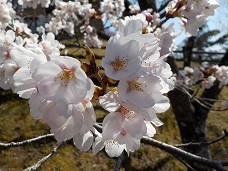 It is autumn in New Zealand and it is spring in Japan – yes, it is the cherry blossom season there! People in Japan do ‘hanami’, blossom viewing picnic; they enjoy obento (= box lunch), beer and so on under/near the beautiful trees. You can see beautiful cherry blossom in September in New Zealand but people do not do such a picnic here.